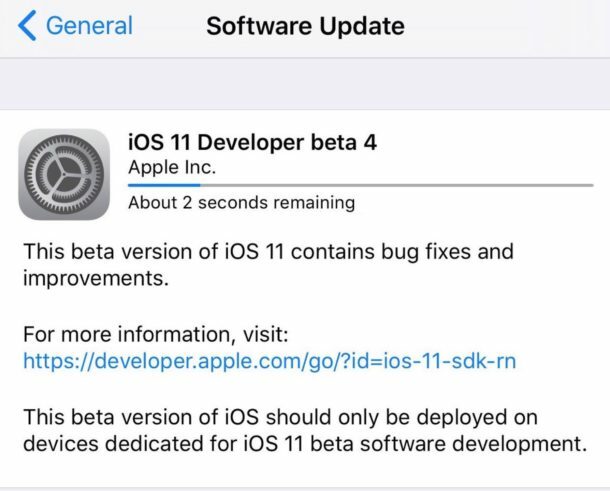 Apple has released the fourth beta version of iOS 11, macOS High Sierra 10.13, tvOS 11, and watchOS 4 to users enrolled in the developer beta testing programs. The latest beta builds continue to refine and improve the various Apple operating systems that remain under active development. As usual, the easiest way to download the latest beta release is through the over-the-air software update mechanism. In iOS that is via the Settings app, in macOS that is through the Mac App Store, in tvOS it’s through the Settings app, and on Apple Watch it’s through the paired iPhones Watch app. Always backup any device before installing any system software update. Public beta builds equivalent to iOS 11 beta 4 will likely be available shortly. The new developer beta builds often arrive before public beta releases, which lately have been showing up a few days after a developer build has been released. The public beta releases are also versioned one number behind, meaning the next public beta release will be “public beta 3” rather than “beta 4” despite largely being the same builds. Developer betas are intended to be limited to registered Apple Developers. However, anyone can enroll to participate and use the iOS 11 public beta or install the macOS High Sierra public beta programs, but be forewarned that beta system software is notoriously unreliable and buggy compared to a final release. Accordingly, beta system software is best run on non-primary and non-essential hardware. Both macOS High Sierra and iOS 11 are due for a final public release sometime this fall.